Eurosport France are reporting that Arsenal are set to sign Riyad Mahrez from Leicester City, with the headline claiming that Mahrez has chosen Arsenal and that it (the transfer, one presumes), will not take long, with a fee of around €50m (£42m in today’s post-Brexit exchange rate) being mentioned. According to Eurosport, representatives from the club met with Mahrez’s agent during Friday’s friendly with Lens, and having been contacted with this information, Mahrez’s agent offered no comment. Claudio Ranieri’s statement, that Mahrez would stay at Leicester, apparently did not change the mind of the Algerian international, who wishes to leave for a bigger club. Mahrez was the PFA Player of the Year last year for his exceptional season, scoring 17 goals and assisting 11, usually from a wide right position. When played from the wide right, he was a dribbling, creative inside forward, whereas from the left he was more of a winger. While some have compared him to Mesut Özil, the two are very different; Mahrez is more of a left-footed Alexis Sánchez, which could create some issues of balance. Both like to dribble inside, and have a propensity to lose the ball a lot in the final third, which doesn’t exactly gel with the style of Özil, and also overloads the middle. 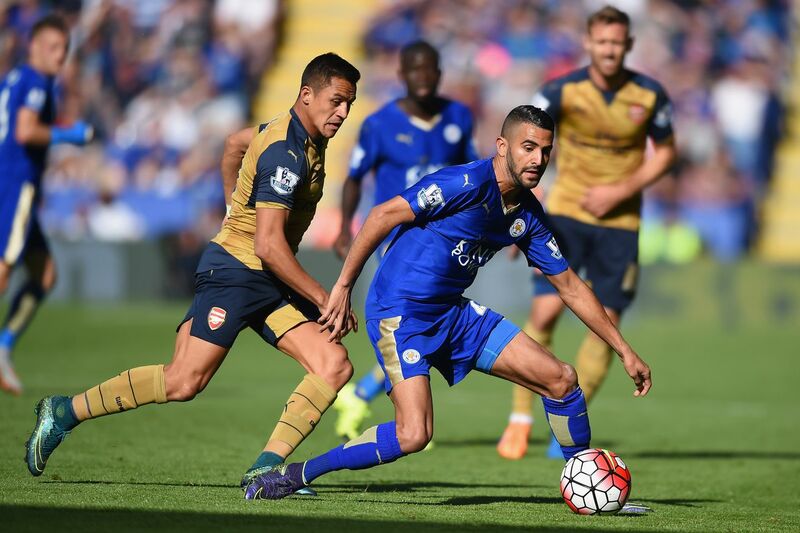 Arsenal played far better football with Alexis on the right and Alex Iwobi on the left, and signing Mahrez could be an indication that Arsène Wenger does not see an available striker that would be an upgrade on what he has for a reasonable price. With Mahrez, Arsenal could revisit playing Alexis Sánchez at centre forward in certain games, which he has done to some success for Chile, albeit usually in a partnership. Having Mahrez on the right and Alexis at centre forward could also allow Arsenal to play Santi Cazorla out wide again, as the balancing playmaker, because of the pace and energy of Alexis and Mahrez. One aspect of yesterday’s friendly that was interesting was how Alex Oxlade-Chamberlain, having started from the right hand side, moved to the left hand side around the 60 minute mark, and was fairly comfortable before moving back to the right and scoring the equaliser. Such fluidity could do Oxlade-Chamberlain’s chances of starting no harm, even with the addition of Mahrez. What this all means for Jack Wilshere is less clear; Wenger is loathe to play two left footers in both wide positions, as he is to play two left-footers in deeper midfield positions, and Granit Xhaka will be one of the first names on the teamsheet. While we await further news from other sources to determine if this signing is indeed happening, it does appear that the club are committed to upgrading the forward line. Reports have emerged that Mahrez’s agent was at the Lens game because he’s working on a transfer for an eighteen-year-old client of his who plays for Lens. According to GFFN, however, that client does not have a transfer situation pending at all. He’s impressed at the youth level and looks primed to stay with Lens for another year. Furthermore, Bilal Ghazi, a high-ranking journalist at the reliable French newspaper L’Equipe, has backed up the earlier reports from Eurosport when asked about Mahrez.